“Who ARE you?” is a phrase that pops up a lot in “The Equalizer.” It’s usually directed at the quietly deadly Robert “Bob” McCall (Denzel Washington) and asked — shrieked, really — by a terrified Russian mobster about to meet a bloody end. It’s a fair question, too. Who is this figure, and why does he seem both indestructible and over-familiar? Surprisingly, the late-’80s TV show “The Equalizer” has little to do with it, even though the set-up is the same: A former secret agent, now an urban loner, rights wrongs and metes out justice to society’s scum. Where the late British actor Edward Woodward created a rough but courtly avenger for the show, Washington and director Antoine Fuqua plug into a more marketable tradition of Men with No Name, wandering samurai, death-wish vigilantes, and righteous dudes who just Won’t Take It Anymore. So this “Equalizer” is a brooding, brutal origin tale, one that starts well but steadily caves into genre clichés. It’s a B-movie sheep in A-movie clothing, acceptable meathead mayhem as long as you know what you’re paying for. That said, Washington is never not watchable, and he makes his character a charismatic mystery man. Bob’s a well-liked older employee at a big-box hardware store called “Home Mart” — I’m guessing Home Depot was all signed up for product placement until they read the script and saw how many bodies pile up in the Patio & Garden aisle. By night, he lives a life of night-owl minimalism, patronizing a local diner when insomnia hits and lining up the utensils with a care bordering on OCD. Whatever his previous job was, it has left him coiled like a spring. Bob reads Hemingway and talks like him, too — short, functional bullets of dialogue that reveal nothing and that harden when he’s crossed. That would be when a teenage prostitute named Teri (Chloe Grace Moretz, and I hope she doesn’t think this is going to be her “Taxi Driver”) is menaced by a slavering Russian pimp (David Meunier). Bob follows the pimp to his nightclub den, sets his watch to 16 seconds, and takes out a room full of thugs using the tools at hand, which include a pair of corkscrews. He’s finished 28 seconds later. Clearly, Bob has been slacking. Since the room apparently contained “the entire East Coast hub of the Russian mob,” Mr. Big back in Moscow (Vladimir Kulich) dispatches his pet assassin, one of those movie sadists who speaks softly and rips out your spleen. His name is Teddy — no, really — and he’s played by the fine actor Marton Csokas (“Lord of the Rings”). That means that both the movie’s hero and villain are repressed sociopaths, so the climax in which the two confront each other plays a little like homicidal chess. Or it would if the characters weren’t pulling every potentially lethal power tool off the Home Mart shelves. I kept waiting for the toilet plunger. Nor is this movie going to turn up in Vladimir Putin’s Netflix queue any time soon, since the Russians are back to being the movies’ all-purpose cardboard villains. The last time Fuqua and Washington worked together, the movie was “Training Day” (2001) and the actor won an Oscar. Won’t happen this time. While Washington roots his character in idiosyncratic moments, predatory calm, and a background hum of trauma, the movie itself never rises above pulp — or turns it to smarter ends — the way the earlier film did. 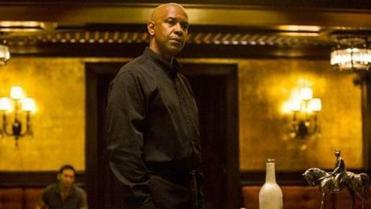 On the contrary, “The Equalizer” becomes more obvious and less believable as it goes. By the time our hero has inexplicably turned up in a bad guy’s bedroom in a completely different country, we could be watching a vehicle for Steven Seagal, Jason Statham, or one of the Expendables. And I don’t thank that’s the kind of equalizing anyone had in mind.